Merseyside guitar rockers The Coral made their indelible first impression on the UK music scene in 2002 with a self-titled debut album that garnered the then-six-piece band a Mercury Prize nomination. Following that promising lead, the band recorded six more LPs over the course of the noughties before taking a five-year hiatus starting in 2010. During their off-time, band members focused on individual solo projects, and a previously recorded album, ‘The Curse of Love’, was released in late 2014. In November 2015, The Coral announced a comeback, heralding the release of a new album, ‘Distance Inbetween’, which was released in March 2016. ‘Distance Inbetween’ was met with critical praise from reviewers at NME and The Independent, among others, and the band evidently felt the need to strike again while the iron was hot. They followed ‘Distance Inbetween’ with an EP release at the tail end of 2016, in the form of ‘Holy Mountain Picnic Massacre Blues’. The LP is a reimagining of ‘Distance Inbetween’, at least in parts. Of the tracks on the new EP, only ‘Holy Revelation’ and ‘Connector’ are taken from the full album. ‘Holy Revelation (Andy Votel’s ‘Holy Mountain Picnic Massacre Blues’ De-Mix)’ more than doubles the original track’s duration at over 8 minutes’ running time. It takes a fairly standard guitar rock track, which was quite catchy in its original form, and makes it into a psychedelic sonic exploration of the foundational rhythms and melodies. Surprisingly, it never feels self-indulgent. Instead, the band seem to be making themselves comfortable here, as if The Coral are stretching their legs and kicking off their shoes, allowing themselves some space to grow, and in the process adding depth and texture to their sound. ‘Connector’, the shadowy album opener from ‘Distance Inbetween’, is recreated here in a woozy and hallucinogenic synth dressing. The bass and the beat are both more aggressive in this Voyagers’ remix, and frontman James Skelly’s vocals are moved farther back in the mix to accommodate the dark dance-pop vibe. The EP features one brand new track, the verbosely subtitled ‘After the Rain (Post WW3 Return of the Super Turv Mix)’, which received airplay from Steve Lamacq at BBC 6 Music ahead of the EP release. Edgy and sinuous with a deep bass groove, its harshly synthetic instrumental bridge contrasts jarringly with frontman Skelly’s smooth, dark vocal melody. ‘Unforgiven’, previously released as the b-side track to The Coral’s ‘Chasing the Tail of a Dream’ single from January of last year, is more acoustic sounding and less kaleidoscopic in color, but nonetheless psychedelic in its way. Its vocal and instrumental harmonies are weirdly wandering, but also warm and hazy around the edges, which allows the EP to close on a distinctly lighter and mellower note than where it began. ‘Holy Mountain Picnic Massacre Blues’ is probably best thought of as an accompaniment to ‘Distance Inbetween’. Stylistically, it’s a bit all over the shop on its own, but in comparison to the tracks on the full LP, these songs make a little more sense. Taken in conjunction with the definitive precision and back-to-basics mentality of ‘Distance Inbetween’, ‘Holy Mountain Picnic Massacre Blues’ displays The Coral’s outside-the-box approach to music-making and their willingness to evolve their sound, even as their career stretches past the 20-year mark. The Coral’s full-length album ‘Distance Inbetween’ and their latest EP ‘Holy Mountain Picnic Massacre Blues’ are both out now on Ignition Records. For more on the Merseyside band on TGTF, follow this link. Liverpool area psychedelic legends The Coral have announced a new UK tour for this December. This winter tour will allow them to get back out on the road and further support ‘Distance Inbetween’, their new album released back in March. It was their eighth album overall and their first new album after a 5-year hiatus. ‘Million Eyes’, their next single, will impact on the 9th of September; it’s available to stream and download now. Presale tickets go on sale today at 10 AM; the general sale commences Friday, the 5th of August, at 10 AM. In case you’ve been living under a rock, The Wirral band The Coral are back this year with a new album. ‘Distance Inbetween’ was released in March, and now they’re announcing details of an another single to come from the record. ‘Holy Revelation’ will be ushering the second May bank holiday in on the 27th of May. The legendary psychedelic band from the North West just performed on Later with Jools Holland on Tuesday night. For more on The Coral on TGTF, go here. The PR machine for Liverpool’s psych rock legends The Coral‘s new release in March is already going full throttle. Unconvinced? James and Nick of the band were interviewed on the Radcliffe/Maconie programme on BBC 6 Music on Wednesday; listen back on BBC iPlayer of the whole chat here. Last week, we posted the video for ‘Chasing the Tail of a Dream’, an early single off of ‘Distance In-Between’, the North West group’s eighth album and their first new material after a 5-year hiatus. This new LP will be out on the 4th of March on Ignition Records. This Saturday, we have for you another video for you from the album. The visualisation for ‘Miss Fortune’ follows very much in the same vein as that of the ‘Chasing the Tail of a Dream’ promo: weird red, pink, and blue colours are overlaid on top of oozy, woozy images while the song bangs on in the background. Have a watch of it below. Check out all of TGTF’s coverage of The Coral through here. 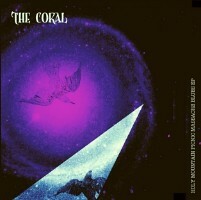 A few weeks before we bid adieu to 2015, Liverpudlian psychedelic legends The Coral announced that a new album from them would be appearing on store shelves (both literal and virtual) in early March. ‘Distance In-Between’, their eighth album and their first new material after a 5-year hiatus, will be out on the 4th of March on Ignition Records. For those of you just chomping at the bit for new Coral, with your pre-order of the album, you’ll receive a free download of early teaser ‘Chasing the Tail of a Dream’ instantly. The song is also available in a limited edition, signed 7″ single format and can be purchased directly from the band’s own Web site. The band have also been revealed to be one of the headliners of Liverpool Sound City 2016 in May. As one might rightly expect, the promo video for ‘Chasing the Tail of a Dream’ takes full opportunity of highlighting the Coral’s reputation for dreamy psychedelic licks. Channeled through a multicoloured visual experience that includes simple yet trippy white silhouettes of the band superimposed over (or is that behind?) time-lapse photography of noving fractals. Should you be smoking something while enjoying this video? Probably. Watch the new Coral video for ‘Chasing the Tail of a Dream’ below.